Notes: A limited edition collection of Philatelic Covers Honouring Europe's Ten Reigning Sovereigns issued in 1978. Countries included: Belgium, Denmark, UK, Liechtenstein, Luxembourg, Monaco, The Netherlands, Norway, Spain and Sweden - each country covering 2 pages. The above Royal Mail Coronation 25th Anniversary stamps were issued on 31 May 1978 by Royal Mail and feature the following stamp designs: 9p State Coach; 10 1/2p St Edward's Crown; 11p Orb; 13p Imperial State Crown. 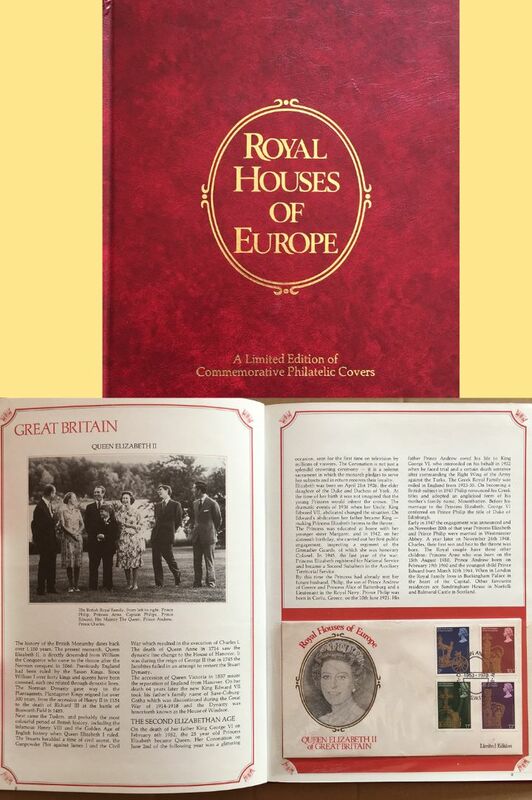 The Royal Houses of Europe first day cover with the Various CDS Postmark postmark and features these stamps which can make a very collectible and lovely gift.